You will love the ergonomic freedom and feminine, active fit this jacket offers. You can wear it as a nice stand-alone piece or a layering piece, as it will accommodate free movement of layers. 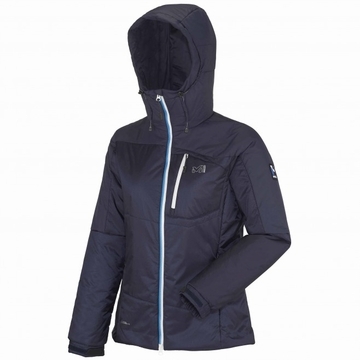 It is insulated with Primaloft Silver, a waterproof and breathable insulation made of recycled material. The expert’s advice: “Primaloft is energy efficient. It will keep you warm when it matters most, adapting its heat transfer to your body temperature”, explains Alex, product manager. The jacket is compact and a durable water-repellent will deliver protection in the dampest conditions. Did you know ? The Trilogy collection gets its name from the solo peak bagging winter ramble of the Cervin, Eiger and Jorasses’ North faces by Éric Escoffier and Christophe Profit. With this epic challenge, these two mountaineers from the Millet team set the ground of modern mountaineering in the 80s: Take the essential with you and carry the lightest weight on your ascent. Trace routes. Climb quickly and steadily. It is the lightweight “revolution”.